I didn't see any thread like this so I thought of creating a topic about former volumes of the NOW series. Which are your faves, do you have any particular memories of a volume's purchase, what were the greatest tracklists, the 10th anniversaries and the Millenium series and so on. NOW 27 - The first CD I've ever purchased after getting my Grundig stereo for Christmas 1994. 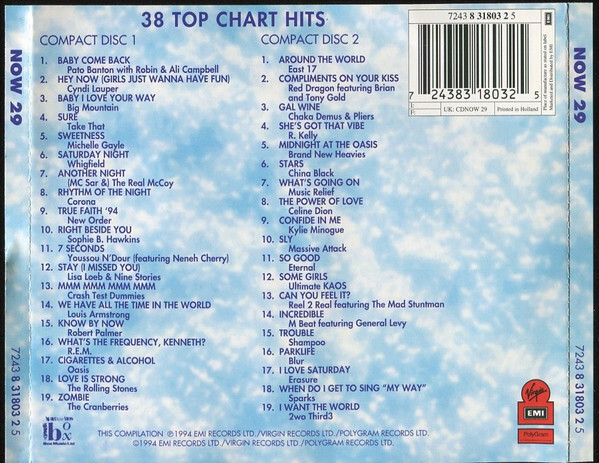 NOW 34 - The evidence that 1996 was the best year in music of the 90's with pop, brit-rock, hip hop/r&b and dance all profusely in with some of the decade's top classics of those genre in it (Wannabe, Children, Wonderwall, Born Slippy, Return Of The Mack...) plus many 80's stars still enjoying some 90's glory (Bryan Adams, Belinda Carlisle, Bon Jovi, George Michael, Tina Turner, Belinda Carlisle, OMD). Its only dud is not having the original version of Macarena. NOW 43 - Excellent CD1, shame CD2 falls short in comparison. NOW 44 - The all-time best selling volume of the series and rightfully so, with plenty decade-end classics in it. And including Baby One More Time on this volume, rather than on NOW 42 or 43, somehow made more sense. NOW 50 - Excellent Christmas volume making up for the slight letdowns of 48 and 49. - Besides Mysterious Girl (NOW 34 & 57) and Set You Free (NOW 30 & 50), which songs were featured in the regular series twice (with the same edit)? - How many songs that didn't hit the top 40 were included in the regular series? The only two that come to my mind are Wonderman and Flee Fly Flo. 2014, Eric Generic, _Gru_ and 1 other person like this. I must have bought soooo many Nows during the 90s/early noughties. I don't think I own any of them any more. Must have got scratched or the tape ruined. I vividly remember Now 28 had Shine by Aswad and I Swear by All 4 One on it. Those were two of my absolute faves at the time. I always used to think Tape or CD 2 was weaker than the first. Eric Generic and P Grandson like this. In summary: 1984's pop smashes, 1988's acid house and two brilliant 90s volumes. The proper Macarena is on Fresh Hits '96. Eric Generic, Rooneyboy and P Grandson like this. Glad you listed this one. Though not my absolute favourite volume, the opening punch of "Wannabe" followed by Robbie Williams' solo debut felt very much like the start of a new era. AfternoonsInUtopia, Eric Generic and P Grandson like this. I recall Grace Jones' I'm Not Perfect (But I'm Perfect For You) being on Now 7 or 8 and missing the top 40 ... I think it may have been the first time as it was thought to be (and should have been) a sure-fire hit at the time. Edit: It was Now 8 and also included Billy Bragg Greetings To The New Brunette and Doctor and the Medics Waterloo both of which also fell short of the Top 40, so three of the thirty-two tracks were not actually hits. Interesting given how packed with iconic tracks the charts were at the tail end of 1986. Baby Clyde, Eric Generic and nlgbbbblth like this. First one I bought was #37 i think it was, in 1997: Hanson, Eternal, Spice Girls, George Michael... I loved it. I think I bought the two successive ones but barely recall them as I was just discovering and falling in love with 80s music and bought the 1989 to 1993 tenth anniversary series plus the 1988 millennium series one. Loved all of them, was surprised that on the Millennium one there were quite a few non-top 10 hits like Julia Fordham, Robbie Robertson or Johnny Hates Jazz, same with the 1993 one but I assumed it was due to it probably being released during the summer of 1993 and only featuring the first half of the year. (And including Sade and k.d. lang because of it was a fantastic decision in my book, so no complaints there). Anyway 1988 to 1992 is still my favourite music era in great part thanks to those compilations. Eric Generic and nlgbbbblth like this. Booers, Eric Generic and Cowboystyle like this. You say the same edit, but actually Mysterious Girl is faded out early on Now 34. Umboza - Sunshine has over a minute cut out as well. I used to hate compilation edits in the 90s. 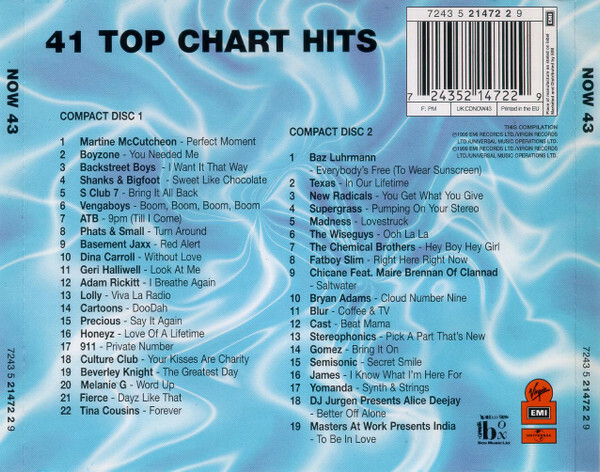 There were always a lot more edits on those Hits 96/New Hits 96 etc compilations. Except it has 10 seconds edited on that too!
! Never noticed, cheers - will update the review. Now 11 is the best ever. 2014, kermit_the_frog, Hudweiser and 4 others like this. There's definitely a thread on the Now series on here as I remember contributing to it but the search function on here is useless and I can't be bothered looking. Now 10 has a huge significance in my life as it was my first proper album and I played it to death. T'Pau's China in Your Hand is still amazing! The NOW brand has quite literally been there all my record-buying life, NOW1 coming just before I started to collect singles and albums. My first NOW was NOW 2, on vinyl for my 13th Birthday (a little time after release, actually). It's still one of the best, in my opinion - sides 3 and side 4 in particular have some of the most evocative hits of that winter/spring. I didn't buy another one until NOW29, believe it or not. And that was in a WH Smiths sale; it was the inclusion of Lisa Loeb, Crash Test Dummies and Sparks that attracted me to it. Someone at school would always have the latest NOW on cassette or vinyl, so we'd get to hear it during breaks or if we happened to spend time at each other's house in the holidays. I felt pretty familiar with most of the first 8 NOWs. NOW6 is a favourite, it captures that time - or how it felt to me - extremely well. NOW8 had too many flops, and NOW9 had the dullest sleeve imaginable, not a good sign. Plus the CD versions were still stupid single disc affairs, which in 1987 began to look misguided. The fatbox NOWs of 10-28 passed me by, due to reasons of cost and my distancing from the pop mainstream. Needless to say, I've spent the last decade gradually picking them all up, with just 10, 14 and 20 eluding me. I have 14 on vinyl, given to me as a gift, and it had some decent tracks on that. I did tend to prefer the first NOW of each year, the Spring edition, the Summer ones had too many novelty/reggae/upbeat songs for my tastes, and then the pre-Xmas NOWs could be a bit top-heavy with scmaltz. NOW34 was the first one I ever bought on the week of release, August 1996 in the old HMV Guildford. As @Pop Life says, there was just a vibe around it, and despite being a summer edition, it was stuffed full of great tracks.The clear hinged jewelcase felt sleeker and fresher, and the artwork had yet to descend into interchangeable crap. I carried on buying them all from NOW34 up to about NOW59, which has my favourite of the post-fatbox designs. Any that I have after 59 have been bought on the cheap (some REALLY cheap!) and I keep them in a box but don't really feel anything towards them or any great desire to revisit the music on them. Whereas my heart skipped a beat recently when I happened across a copy of NOW11 on CD tucked away in a used store. kermit_the_frog, Pop Life, nlgbbbblth and 3 others like this. 23 was my first - double cassette, then I was patchy all the way up to 57 and have collected them all since then, and back-collected to 20, plus 16 and the reissue of the original. 29-31 were amazing and most of the 40s and 50s were awesome too. It's weird how the number of 'features' had soared in the last decade. Such a cool way to look back over decades of music though; the number of songs I hated at the time which I've now come to love is extraordinary. 100 should come out just after I turn 40 and I'm stopping at 101.
nlgbbbblth, AfternoonsInUtopia, idratherjack and 1 other person like this. This thread has inspired me to update my iTunes with playlists to recreate ALL the NOWs from 1 to at least 29.
idratherjack, P Grandson, Pop Life and 1 other person like this. Try and use vinyl rips for 1-9, very difficult to put together otherwise. Yeah, they won't be properly accurate by using CD versions, but I'll settle for as close as. Although I don't own NOW20 on CD (yet! ), I am able to almost recreate it as I have all but two of the tracks already in my iTunes library. One of those, Radio Wall Of Sound by Slade, I have on a Slade comp in storage so that can be sorted out, but amazingly I don't have Don McLean's American Pie at all. Crying, Vincent and even Castles In The Air...but not his most famous hit. It's probably because I have little interest in the 70s as a whole, I checked through my 70s compilations and to the best of my knowledge it isn't on any of them. So what's the easiest/cheapest way to get the track? Is the 8 minute Full Length version on NOW20 the only mix? Is there an edit? There is a 7" edit of American Pie. AKA Part 1. It's on CD - will check. EDIT - found it. On disc 2 of Now That's What I Call 70s. It's on CD - will check. Found it. On disc 2 of Now That's What I Call 70s.